The president took the DNC stage on Wednesday, showing why he will be his one-time rival's best advocate this fall. Barack Obama needed to bring Democrats together tonight at the DNC. Tim Kaine had a far more difficult task: Hillary Clinton’s vice-presidential pick needed to prove he can be trusted, has the capacity to inspire, and can effectively take on Donald Trump. In the end, Obama and Kaine both won raucous cheers and applause. At one point during the president’s speech, someone in the crowd cried out: “Four more years!” Another screamed: “I love you!” And despite earlier threats of revolt from Bernie Sanders supporters, Kaine made it through his speech without major incident. He came across as dedicated to the cause, and ready to fight, hitting high notes along the way. In all, the evening showed a party that seemed far more willing to come together than it did when the convention began. When Obama took the stage, he argued that the election is not really about ideology or partisan politics. “This is a more fundamental choice about who we are as a people,” he argued. He offered an uplifting message in contrast to Donald Trump’s dark vision of America. “I am more optimistic about America than ever before,” he said. But he also acknowledged the suffering across the country. He was quick to note the “real anxieties” of many Americans. “There are pockets of America that never recovered from factory closures,” he said, “men who took pride in hard work and providing for their families who now feel forgotten.” The contrast highlighted a challenge for Democrats: The party is working to offer voters are more inspiring vision of America, but as it does, Democrats must be careful not to seem blind to voter concern. Obama is poised to be the most powerful advocate for Clinton on the campaign trail—he demonstrated that tonight. But there was also poignancy to the speech. As much as it was a chance for Obama to vouch for Clinton, it was also a kind of goodbye. The president’s description of what he has achieved in office is as much a reminder that he will soon depart the Oval Office to make way for a successor as anything else. It was a farewell tour delivered to an adoring audience. “I love you back,” the president told the crowd as he took the stage to wild applause. Yet even if Obama is on his way out, the evening was also a reminder that if Clinton is elected, his legacy will live on. At the end of his speech, Clinton herself took the stage, the two stood side-by-side as they waved and surveyed the arena. There were signs of a divided party. Former Secretary of Defense Leon Panetta was interrupted during his speech by angry chants of “no more war!” The confrontation was emblematic of the fact that many Democrats fear Clinton is far too interventionist when it comes to foreign policy. As Kaine and Obama spoke, some delegates held up anti-TPP signs in opposition to the trade policy the president has pushed. Ron Fournier July 27, 2016, 11:47 p.m.
We all could have long careers and not hear another speech that good. Clare Foran July 27, 2016, 11:47 p.m.
Barack Obama and Hillary Clinton on the DNC stage together at the close of Obama’s speech. Nora Kelly July 27, 2016, 11:42 p.m.
Priscilla Alvarez July 27, 2016, 11:41 p.m.
President Obama praised Hillary Clinton in his remarks and to conclude he passed the baton, as Clinton joined him on stage. Obama is drawing a sharp contrast from Donald Trump’s divisive rhetoric on immigration. In a story about his grandparents, the president folded in American values that, he said, “drew immigrants here, and they believed that the children of those immigrants were just as American as their own, whether they wore a cowboy hat or a yarmulke; a baseball cap or a hijab.” Obama has delivered rebuttals to Trump’s remarks in the past, but tonight he drew from his own past to deliver his message. Nora Kelly July 27, 2016, 11:40 p.m.
Vann R. Newkirk II July 27, 2016, 11:37 p.m.
Here’s the dangerous turn. How does he leave the stage without support for Clinton being drowned out by “four more years” chants? Vann R. Newkirk II July 27, 2016, 11:34 p.m. This was is a masterful play from President Obama in using his popularity among both Sanders and Clinton supporters to cement the party’s reunification that has been taking place over the past few days. In praising Sanders supporters—who seem even more unwilling to boo him than they are Sanders himself—he gave them one last courtesy, but also took away some of their last bits of power on the convention floor. Priscilla Alvarez July 27, 2016, 11:29 p.m. The latter is likely a nod to a U.S. Supreme Court ruling that delivered a blow to Obama’s plan to shield millions of undocumented immigrants from deportation. The administration had hoped to mark it down as a staple accomplishment, but now if elected, it’ll lie on Clinton. Emma Green July 27, 2016, 11:24 p.m. This speech is full of one-liners, delivered by a semi-skeptical-sounding Obama. “The american dream is something no wall will ever contain,” he says. Clare Foran July 27, 2016, 11:20 p.m. Someone in the crowd yelled out “four more years!” after applause died down during Obama's remarks. Nora Kelly July 27, 2016, 11:20 p.m. The story President Obama just told—how he surprised Hillary Clinton when he asked her to be his secretary of state—is one she employs constantly on the stump. I traveled on behalf of our country, a lot of people would ask me how President Obama and I could work so well together after being such fierce competitors. In some places, you know, the person who loses an election gets exiled or executed, not asked to be secretary of state. But President Obama asked me to serve and I accepted. You know why? We both love our country. Eight years ago, you may remember, Hillary and I were rivals for the Democratic nomination. We battled for a year and a half. Let me tell you, it was tough, because Hillary was tough. … Every time I thought I might have the race won, Hillary just came back stronger. But after it was all over, I asked Hillary to join my team. She was a little surprised—some of my staff was surprised—but ultimately said ‘yes.’ Because she knew that what was at stake was bigger than either of us. Priscilla Alvarez July 27, 2016, 11:15 p.m.
“Don’t boo. Vote,” Obama says after the crowd erupts in boos at the mention of Donald Trump. Priscilla Alvarez July 27, 2016, 11:07 p.m. The Republican National Convention and Democratic National Convention have illustrated two different Americas through a slate of speeches. And now, Obama is launching into his vision. “Most of all, I see Americans of every party, every background, every faith who believe that we are stronger together—black, white, Latino, Asian, Native American; young and old; gay, straight, men, women, folks with disabilities, all pledging allegiance, under the same proud flag, to this big, bold country that we love. “That’s the America I know,” he exclaimed. Andrew McGill July 27, 2016, 11:06 p.m. I wondered if someone would interrupt Obama’s speech. “There are pockets of America that never recovered from factory closures,” he said. On cue, someone from the audience shouted “No more TPP!” Obama talked over him and continued. Nora Kelly July 27, 2016, 11:06 p.m.
Priscilla Alvarez July 27, 2016, 10:58 p.m.
Twelve years ago, President Obama surprised the delegation at the Democratic National Convention when he delivered remarks for then-Democratic nominee John Kerry. Four years later, he became president. And tonight, his farewell tour kicks off. Clare Foran July 27, 2016, 10:57 p.m. Loud cried of “Yes, we can!” rang out as the president thanked everyone for the enthusiastic welcome. “I love you back,” he said. The delegates rise for Obama. Nora Kelly July 27, 2016, 10:56 p.m.
From CSPAN’s feed, it looks like the delegates are all on their feet to greet the president, waving signs with his name on them. Clare Foran July 27, 2016, 10:56 p.m. The crowd burst into cheers and applause as Obama stepped to the podium. Emma Green July 27, 2016, 10:50 p.m. This review of Obama’s presidency is heavy. It’s a reminder that for all the cheering that’s been happening at the DNC, a lot of terrible, heartbreaking things have happened over the last eight years. Vann R. Newkirk II July 27, 2016, 10:49 p.m. Threw Rahm under the bus in the opening video. Nora Kelly July 27, 2016, 10:49 p.m.
Priscilla Alvarez July 27, 2016, 10:42 p.m.
Kaine called Clinton “lista”—a word he learned during his time in Honduras that means ready. “What ‘listo’ means in Spanish is prepared, battle-tested, rock-solid, up for anything, never backing down. And Hillary Clinton is ‘lista,’” he said. Kaine will likely be repeating different versions of this line on the campaign trail. He already used it during a rally in Virginia earlier this month. Vann R. Newkirk II July 27, 2016, 10:37 p.m. Senator Tim Kaine accepted the Democratic nomination for vice president tonight with an emphasis on his distinctive background and experience, along with a combative stance against Donald Trump’s vision of America. In the process, he provided a memorable speech that fit the Democrats’ strong emphasis on unity throughout the convention—a line directed to Bernie Sanders supporters prompted a rowdy applause—and their special emphasis on rebutting Trump tonight. Kaine began with classic acceptance speech stuff: his origin story. That story is somewhat typical of the Americana-tinted visions most candidates provide of themselves, but Kaine’s recollection of a trip to Honduras—and as Priscilla noted, the Spanish that came during that recollection—gave that story extra weight. “Somos Americanos todos,” he told the crowd, to cheers. After selling his own candidacy for vice president to the crowd, Kaine moved to the two duties of any good VP pick: pitching the presidential nominee and attacking the opposing nominee. In his case for running mate Hillary Clinton, Kaine used a word that hasn’t been used often for her, especially after the latest round of an email scandal—trust. “So let’s talk about trust,” he told the crowd. “I want to tell you why I trust Hillary Clinton.” What followed was a full-throated defense of Clinton from a moral and character perspective; not the kind of cynical “lesser of two evils” rhetoric that fellow convention speaker Michael Bloomberg gave or the kind of begrudging competence-based support that has been covered thoroughly at the convention. It seems the Democrats have found their man to address Clinton’s most enduring weakness among voters. Kaine then played up a similar public lack of trust in Trump, parroting Trump’s classic phrase “believe me” several times—badly—as a theme in his speech. He used a strategy that has proven effective before: attacking specific incidents in which Donald Trump as a businessman acted in untrustworthy ways. Kaine’s goal tonight seemed to be to make the case for Clinton as a more trustworthy candidate than Trump, and to continue the night of unity sparked by sing-alongs of “What the World Needs Now Is Love” and “Stronger Together” signs. He delivered. Nora Kelly July 27, 2016, 10:31 p.m. The Trump campaign was seriously prepared for Tim Kaine's speech tonight. In the 20-odd minutes since the Virginia senator's introductory video began rolling, the Trump team has released four separate press releases criticizing Kaine’s career and comparing him with the GOP’s vice-presidential nominee, Mike Pence. The emails may be evidence of Trump’s recent investment in rapid-response communications. Priscilla Alvarez July 27, 2016, 10:31 p.m. In his rebuke of Donald Trump, Tim Kaine is trying to prove that he can fulfill the role of the attack dog at Clinton’s side. Maybe he should keep the impressions at home, though. Vann R. Newkirk II July 27, 2016, 10:27 p.m.
Is this an imitation of Sanders’s imitation of Trump? Priscilla Alvarez July 27, 2016, 10:25 p.m.
Vann R. Newkirk II July 27, 2016, 10:23 p.m.
Kaine’s tie choice is a strange one for a nomination-acceptance speech, as many candidates go for solid colors—red, blue, and purple most likely—or subtler patterns. But his tie’s wide diagonal red and gray stripes and its broadness are holdovers from an older sartorial era. It’s certainly unconventional, but it fits with the workman-like quality of Kaine’s speech. It gets the job done. Clare Foran July 27, 2016, 10:22 p.m. When Tim Kaine invoked Bernie Sanders’s name, he nearly lost control of the crowd. There are loud cheers, but it also seemed to have hit a nerve, perhaps because some Sanders supporters saw it as pandering. Kaine recovered quickly, though. “We all should feel the Bern and we all should not want to get Berned by the other guy!" he said. After that, there was audible shushing going on in the crowd, presumably as some Democrats tried to quell dissent. Priscilla Alvarez July 27, 2016, 10:16 p.m. Roughly 10 minutes into his speech, Tim Kaine flaunts his Spanish. The Virginia senator’s grasp of the Spanish language comes from his time as a missionary in Honduras. His proficiency likely contributed to Hillary Clinton’s decision to pick him as her running mate, as it would presumably help her woo Hispanic voters—an electorate that is expected to have increased turnout in November. But there are faults in thinking that it would propel support for Clinton among Hispanic voters. Hispanics are looking at a number of issues, among them education, jobs and the economy, and immigration. And that’s what will matter on the campaign trail. Emma Green July 27, 2016, 10:15 p.m.
Tim Kaine gave a shout-out to his Jesuit high school, winning cheers. “That’s a big line for the Jesuits!” he said. “We had a motto in our school: Men for others,” he went on. Anyone who attended a Jesuit school will recognize this phrase: Teaching the young to be men and women for others is a cornerstone of the Jesuit education and Ignatian spirituality. The Catholic order is known for its educational institutions, which are modeled off one of Europe’s original templates of liberal-arts education, the Ratio Studiorum. Nora Kelly July 27, 2016, 10:10 p.m.
Clare Foran July 27, 2016, 10:09 p.m.
A lot of people in the California delegation are holding up anti-TPP signs while Tim Kaine speaks. Trade policy is one of the sore subjects for progressives when it comes to Kaine as a veep pick. Nora Kelly July 27, 2016, 10:09 p.m.
Joe Biden’s speech Wednesday night wasn’t just an endorsement of Hillary Clinton. It wasn’t just a rebuke of her opponent, Donald Trump. It was a vehicle for the vice president to reflect on his beloved country, in what may have been the last significant speech of his long career. That’s how Biden closed his remarks. But he began his speech on another personal note: complimenting his boss, Barack Obama, as “one of the finest presidents we have ever had,” and thanking his fellow Americans for offering their support since the death of his son, Beau Biden, last year. Vann R. Newkirk II July 27, 2016, 9:57 p.m.
Lenny Kravitz is a cover band who doesn’t know he’s a cover band. Russell Berman July 27, 2016, 9:51 p.m. Helped by a crowd warmed up by Joe Biden, Michael Bloomberg may have won over some Democratic delegates by vouching for Hillary Clinton’s sanity while castigating Donald Trump as a “con” and a danger to the country. It’s notable that the Democrats gave such valuable time to an Independent who explicitly did not endorse their platform, but the former New York mayor delivered one of his better performances and clearly has a resume that lends him credibility to attack Trump’s record as a businessman. It was billionaire on billionaire, and Bloomberg didn’t hold back. Emma Green July 27, 2016, 9:47 p.m.
Priscilla Alvarez July 27, 2016, 9:41 p.m.
Michael Bloomberg is hammering Donald Trump with zingers. “I am a New Yorker, and I know a con when I see one." Emma Green July 27, 2016, 9:39 p.m.
Michael Bloomberg, throwing shade. He styles himself as a business-oriented politician, which perhaps makes him distinctively able to take on Donald “You’re Fired!” Real-Estate Mogul Trump. “I built a business, and I didn’t start it with a $1 million check from my father,” Bloomberg said. Maybe doesn’t make him relatable; maybe proof of why he shouldn’t have run for president, even though he considered it. But it was a smack-down. Russell Berman July 27, 2016, 9:36 p.m.
We don’t often comment on the clothing choices of male politicians, but it is surely no accident that Michael Bloomberg, a political Independent giving a speech criticizing partisan politics, is wearing a purple tie. Priscilla Alvarez July 27, 2016, 9:35 p.m.
Russell Berman July 27, 2016, 9:35 p.m.
Joe Biden right there gave a lesson in how to give a speech with conviction. So many speakers at both party conventions sound like they are reading speeches off the TelePrompter for the first time, haltingly and awkwardly. Biden’s great strength was the clear passion he displayed in that speech, as he became one of the first major Democratic speakers to directly appeal to the white working class voters with whom Hillary Clinton has struggled so much. The reaction in the hall, as it appeared on television, rivaled that of the speech delivered by Michelle Obama on Monday night. The only loser here may be former New York Mayor Michael Bloomberg, a pedestrian public speaker who must follow Biden. Emma Green July 27, 2016, 9:34 p.m.
[He] once said, “there are a small number of people in America who have the power, and the prestige, and the connections to make sure that their interests are looked after.” But he said, “for everybody else, there is the president of the United States.” And that is why we need Hillary Clinton. Priscilla Alvarez July 27, 2016, 9:23 p.m.
Joe Biden off script is the best Joe Biden. Trump is “trying to tell us he cares about the middle class,” he said. “Give me a break. That is a bunch of malarkey!” The crowd erupted in applause. Priscilla Alvarez July 27, 2016, 9:19 p.m.
Joe Biden recalled 2008 when his son, Beau Biden, introduced him prior to his remarks. “This is kind of a bittersweet moment for Jill and me and my family,” he said. Last year, Beau Biden died of brain cancer. His wife and two kids are in the crowd tonight. Clare Foran July 27, 2016, 9:19 p.m.
“Everybody knows she’s smart. Everybody knows she’s tough. But I know what she’s passionate about. I know Hillary,” Biden said. His remarks hit upon a common theme with Clinton, the idea that she presents one face to the public and another to her trusted friends and advisors. Clare Foran July 27, 2016, 9:16 p.m. The arena has become noticeably more crowded in the past half hour leading up to Joe Biden’s speech. People are crowding into the stands and the convention hall looks completely full. Vann R. Newkirk II July 27, 2016, 9:16 p.m.
There’s an underground sign market here that’s fascinating. On Monday people traded shirts and other expensive swag for “Michelle” signs. People stayed behind to scavenge for them long after the last gavel. Tonight, I just saw three people try to trade “Scranton” signs for “Joe” signs. Each was denied. Clare Foran July 27, 2016, 9:10 p.m. The crowd chanted “Joe! Joe!” as Biden hit the stage. Nora Kelly July 27, 2016, 9:09 p.m.
Priscilla Alvarez July 27, 2016, 9:04 p.m.
Jill Biden took the stage to introduce Vice President Joe Biden. “Over the past eight years, America has gotten to know the Joe Biden that I know and love. He is honest and strong, principled and compassionate, he was authentic long before it became a buzzword in politics,” she said, also commending his commitments to education and justice. Clare Foran July 27, 2016, 8:58 p.m.
Panetta gets boos when he says that we cannot afford to elect someone who thinks we should withdraw from the world. Those words probably sound like an invitation to get involved in war to many in the crowd. Clare Foran July 27, 2016, 8:55 p.m. The crowd started cheering “no more war” while former Secretary of Defense and CIA Director Leon Panetta spoke. The chant got so loud he had to pause. Priscilla Alvarez July 27, 2016, 8:43 p.m. In a remarkable moment, Republican Senator John McCain got a loud ovation at the mention of his name by Rear Admiral John Hutson. “Donald, you’re not fit to polish John McCain’s boots,” said Hutson, who served with McCain. Donald Trump said last year that McCain was “not a war hero” despite being a prisoner of war. Sacha Zimmerman July 27, 2016, 8:43 p.m.
Mark Kelly just said that after 25 years in the Navy and as an astronaut, he has “a unique perspective on the world.” That was the correct use of the word “unique,” which is pretty unusual. TV news is riddled with talking heads who say, “really unique,” with shameful abandon. If something is unique it is singular, one of a kind, the only thing of its essence in existence, a priori. Hence, it cannot be more or less unique; it cannot be very unique or wonderfully unique. All I am saying is, going to space is super cool but it is not unique; it is rare. Kelly’s perspective, though, is unique, and tonight he shared that worldview (literally!) with a beautiful acknowledgment of life’s fragility. Nora Kelly July 27, 2016, 8:32 p.m.
During the House sit-in on gun control last month, Gabby Giffords sent a letter of support to her fellow Democrats. Florida Representative Debbie Wasserman Schultz read it aloud from the House floor. “Speaking is difficult for me,” Giffords wrote, words she echoed in her brief remarks Wednesday. “But I haven’t been silenced.” Time has a full copy of the letter here. Priscilla Alvarez July 27, 2016, 8:32 p.m.
Former Representative Gabby Giffords, who was shot in 2011, followed her husband’s remarks. Giffords gave the Pledge of Allegiance at the Democratic National Convention four years ago. Her appearance was moving then, and it was moving tonight. Nora Kelly July 27, 2016, 8:23 p.m. Climate change was Brown’s chief subject Wednesday, and it’s his chief focus during his final term in office. The Sacramento Bee reports that Brown remarked to a friend recently that no issue was more important to him. I think there’s a change in weather. I am not a great believer in man-made climate change. I’m not a great believer. ... Perhaps there’s a minor effect, but I’m not a big believer in man-made climate change. Emma Green July 27, 2016, 8:19 p.m.
It’s remarkable to hear Felicia Sanders and Polly Sheppard, two of the only survivors of the shootings at Emanuel A.M.E. Church in Charleston last summer, speak about the evil and hatred that motivated that shooting. It was a slight departure from the previous speakers, all of whom suffered the loss of relatives in mass shootings—while these two women also mentioned the role of guns in the murders, they mostly focused on what was in the shooter’s heart. Priscilla Alvarez July 27, 2016, 8:14 p.m.
Ron Fournier July 27, 2016, 8:13 p.m.
“We need more than grieving to protect our law-enforcement officers.” —ex-Philly police chief Charles H. Ramsey, channeling cops who want gun curbs. Priscilla Alvarez July 27, 2016, 8:03 p.m.
Priscilla Alvarez July 27, 2016, 8:01 p.m. The crowd fell silent when Christine Leinonen approached the podium. Her son, Christopher, and his boyfriend, Juan Guerrero, were killed in the Orlando nightclub attack last month, which claimed the lives of 49 people and injured 53 others. In the wake of the shooting, the U.S. House Democrats staged a 25-hour sit-in on the chamber floor in response to Republicans’ refusal to take up gun legislation. No consensus was reached, stalling progress on proposed gun-control measures until after Congress’s summer recess. Still, its weight in the Democratic Party was clear tonight. When Leinonen concluded her remarks, the crowd, which listened ever so silently, roared with applause. Clare Foran July 27, 2016, 7:55 p.m.
Christine Leinonen, whose son was killed in the Pulse nightclub attack in Orlando, just spoke. The cameras showed a number of people sitting in the crowd wiping away tears. When Leinonen said that “love always trumps hate,” invoking a key line used by the Hillary Clinton campaign, she got a standing ovation in the arena. One man waved a rainbow flag high above his head. At the end, the crowd again rose to its feet with a roar of applause as she walked off the stage. Emma Green July 27, 2016, 7:45 p.m. The Jesuits are getting good billing at this convention. Besides vice-presidential candidate Tim Kaine, who is Jesuit-educated, California Governor Jerry Brown, who just spoke on climate change, almost became a Catholic priest. Nora Kelly July 27, 2016, 7:42 p.m.
Priscilla Alvarez July 27, 2016, 7:39 p.m. The former Maryland governor ran in the Democratic presidential race and dropped out in February after a dismal showing in the Iowa caucuses. But that’s in the past now. Tonight, he extolled his former rival. “I come here before you as a man who knows Hillary Clinton well. I have worked alongside her and I have competed against her, and I'm here to tell you Hillary Clinton is as tough as they come,” O’Malley said. He then quickly pivoted to delivering a robust attack of Republican nominee Donald Trump. “I say to hell with Trump’s American nightmare. We believe in the American dream,” he exclaimed. O’Malley ticked off policies on which Clinton and Trump are at odds. Take wages (“Wages are too high? Really, Donald?”) and climate change (“She understands that climate change is not only a real threat, it is also the greatest job-creation opportunity to come to the United States in 100 years.”). Robinson Meyer July 27, 2016, 7:36 p.m. Stirring cellos! Silhouettes against the sunset! And … a voiceover from former Republican governor Arnold Schwarzenegger? One of the mini-films played between speakers tonight—the pointedly entitled mini-doc Not Reality TV—may seem to have a little more vim and pizazz than the average political ad. It might just seem a little more Hollywood. Turns out that it has the bonafides to prove it: Not Reality TV was directed by James Cameron, the mega-successful filmmaker who also made Aliens, The Terminator, Titanic, and Avatar. I spoke to Cameron this afternoon by phone. He said that it was important to him that Not Reality TV dwelled on both the terrifying aspects of climate change and on some of the more hopeful solutions. Climate change acts to intensify existing political conflicts and make them worse, further stretching the U.S. military, he said. Nora Kelly July 27, 2016, 7:10 p.m. The tactic of pre-flushing, which helps clear lead from home plumbing prior to a test, is rampant across many large cities. In their most recent test cycles, Philadelphia; Milwaukee, Wisconsin; and Buffalo, New York, tested water for lead in this way. Vann R. Newkirk II July 27, 2016, 6:34 p.m.
Jesse Jackson, Sr. delivered a speech that continued the dominant themes of unity and positivity that have been so effective at the Democratic National Convention so far. He ended on a rousing call-and-response with a sleepy early-evening crowd at the Wells Fargo Center, exchanging chants of “It’s healing time, It’s hope time” with the crowd. Jackson promoted party nominee Hillary Clinton as a counter to Donald Trump’s message of fear and suspicion. “We live under one big tent,” Jackson said. He also placed Clinton as the heir to the “Rainbow Coalition” of progressive whites and minorities that he leaned on during his own presidential campaign in 1984. The theory that liberal whites need minorities and women foreshadowed some of the intersectionality that has been on display among different identity groups at the convention and has shaped the Democratic Party for decades now. Nora Kelly July 27, 2016, 6:17 p.m.
Members of the Asian Pacific American Caucus stumped for Hillary Clinton from the stage Wednesday. What struck me about their appearance: how many “firsts” are represented in the group. Members like Hawaii’s Mazie Hirono, the first Asian American woman elected to the Senate; California’s Mark Takano, the first openly gay person of color in Congress; California’s Judy Chu, the first Chinese-American woman in Congress; New York’s Grace Meng, the first Asian American elected from the East Coast; and Virginia’s Bobby Scott, the first voting member with Filipino heritage. The members shared these distinctions proudly with the delegates, in a sign of growing Asian American power in the electorate. “We have gone from being marginalized to becoming the margin of victory in key swing states and districts all across our nation,” Chu said. Russell Berman July 27, 2016, 6:12 p.m.
De Blasio has made no secret of his national ambitions, traveling out of state frequently early in his tenure. But he seems to be serving out a punishment of sorts after waiting months to endorse Clinton, and he delivered his remarks to a low-energy crowd inside the convention hall. Adding further insult is the fact that de Blasio’s predecessor, Michael Bloomberg, is speaking tonight in prime time, and his Democratic rival in New York, Governor Andrew Cuomo, is expected to have a more prominent time slot on Thursday. Sacha Zimmerman July 27, 2016, 5:10 p.m. Meanwhile, outside the Wachovia Center, things got weird. Russell Berman July 27, 2016, 4:52 p.m.
Kaine’s nomination proceeded without much drama. There wasn’t much of a nay vote when Chairwoman Marcia Fudge called the ayes and nays, although some delegates could be heard chanting, “Roll-call vote,” after she declared him the vice-presidential nominee. Priscilla Alvarez July 27, 2016, 4:51 p.m.
It’s official: Tim Kaine has been nominated by acclamation as the vice-presidential candidate of the Democratic Party. Nora Kelly July 27, 2016, 4:49 p.m. Swing voters are so 1996. Mark Penn, a former strategist and pollster for Bill and Hillary Clinton, suggested Wednesday that there’s an untapped set of voters that presidential campaigns can target to win a general election: some of the 100 million “couch potatoes” who are eligible to vote but don’t typically head to the polls. To Penn’s mind, campaigns can abandon the strategy of attracting swing voters—the “model” of Bill Clinton’s 1996 effort—and instead go after couch potatoes “on one end of the spectrum” to get them on their feet. He warns that candidates could hit a wall, though, once they actually have to govern: “Problem is, when you do win, you don’t bring the country together,” Penn said. A candidate spends the election “trying to stimulate turnout” among a particular subset of voters—he theorizes that this disengaged bloc contains many Hispanic Americans and a “lot of downscale whites”—and not convincing people “to adopt your viewpoint.” Penn, who says he’s not currently advising the Clinton campaign, appeared Wednesday afternoon at an AtlanticLIVE event at the Democratic National Convention in Philadelphia. Priscilla Alvarez July 27, 2016, 4:18 p.m. Does Donald Trump have financial ties to Russia? The Democratic Party has had to fend off its own email scandal in recent days, after an extensive hack and leak of DNC emails showed staffers favoring Clinton. The New York Times reported on Tuesday that U.S. spy agencies are increasingly beginning to believe that Russia may be behind the hack. So what relationship does Trump have with the Kremlin, then? Despite a long history with the country, it’s unclear how much money—if any, at all—is invested in the country. Trump, for one, has refused to release his tax returns, which would reveal the truth. Russell Berman July 27, 2016, 3:18 p.m.
Democrats will be featuring a pair of New York City mayors in Wednesday’s convention program, but the one who is speaking in prime time is not the progressive Democrat who managed Hillary Clinton’s first campaign for the Senate. No, Bill de Blasio—the current mayor—has been relegated to a sleepy late-afternoon time slot. Instead, the much more coveted evening time slot goes to his predecessor, Michael Bloomberg, the political independent and billionaire who considered running against Clinton for president as recently as this spring. This arrangement is surely not what Democrats would have expected to see a couple of years ago, when none other than Bill Clinton administered the oath of office to de Blasio after a surprising mayoral victory that energized progressives far beyond the five boroughs. De Blasio had run in large part against the outgoing Bloomberg, criticizing his policies on policing and embracing a platform tackling income inequality. But he has struggled in the last couple years, and his approval rating has plummeted in recent months amid a fund-raising scandal and the city’s involvement in the sale of a nursing home that was turned into luxury condos. The campaign may also be punishing the mayor for his delayed endorsement of Clinton last year, which came long after other top New York Democrats backed her candidacy and despite his having held a top job on her first campaign in 2000. Bloomberg, meanwhile, will be endorsing Clinton formally for the first time on Wednesday night, and the campaign hopes that as a fellow billionaire and onetime Republican who transitioned into government service, he can be a credible critic of Donald Trump’s business record and his fitness for office. As Bloomberg himself recognized while repeatedly mulling his own White House run, he doesn’t have a particularly broad constituency outside New York. But the campaign believes he can help persuade moderate, likely suburban voters who agree with his more liberal views on guns, immigration, and climate change. Priscilla Alvarez July 27, 2016, 3:13 p.m.
Jerry Emmett couldn’t see much of the convention hall when she announced that the Arizona delegation was casting 51 votes for Hillary Clinton for president. But she felt it all the same. The 102-year-old delegate from Prescott, Arizona is legally blind. On Tuesday, she beamed with excitement during the roll-call vote that ended with the first major-party nomination of a woman for the U.S. presidency. She recalled that moment with CNN’s Brooke Baldwin on Wednesday. “It was the biggest thrill of my life,” she said. It was a particularly remarkable moment for Emmett, who was born before women had the right to vote. Her message to Clinton: “I would say God bless you, Hillary,” she said. Meet some of the other delegates at the convention, including family pairs that include Sanders and Clinton supporters, a 93-year-old-delegate who’s attending her eighth national convention, and a former congressional candidate and veteran. Christopher I. Haugh July 27, 2016, 3:10 p.m.
Tom Torlakson is the governor of California, sort of. With so many Californians in Philadelphia for the DNC, including Governor Jerry Brown and at least eight other top state officials, the state’s superintendent of schools has been the acting governor since Tuesday. He will hold the title until 1:30 p.m. Thursday. According to the state’s constitution, the governor must be within the borders of the state to exercise the powers of the office. More than a dozen other states have similar provisions on their books. Torlakson has embraced the job. Yesterday, he tweeted out an open invitation to take a morning walk him around the state capitol. He also asked his followers what they would do if they were governor for a week. The responses ranged from constructive, to snarky, to plain odd. Then, in his first official act, he declared July 26 “Change Lives—Be a Teacher” Day. Unfortunately, Torlakson has had to make a few serious decisions, too. On Tuesday, he issued a state of emergency in Los Angeles and Monterey counties where two wildfires continue to burn thousands of acres. Torlakson’s “administration” is a curiosity, to be sure. But, in the past, such short-term appointments have also come with consequences. In 1979, Brown, then in his first stint as governor, left California. He returned to find that a Republican lieutenant governor had appointed a judge of his choosing. One imagines that Brown has somehow ensured that Torlakson will be a good soldier this time around. Perhaps we will find out how good when Torlakson offers remarks at Sacramento State University on Friday. Emily DeRuy July 27, 2016, 2:37 p.m.
Maryland Representative Donna Edwards wants more U.S. lawmakers to ask themselves “What do you want for your child?” as they debate how to shape education policy. “I don’t think we ask ourselves enough of those questions,” she said during an Atlantic Live conversation at the DNC in Philadelphia. Edwards recalled visits to Baltimore schools where, she said, children with fewer resources than wealthier areas “know they’re deprived.” Children are “pissed off about it,” and not enough policymakers are equally outraged by funding inequities and differences in resources. Edwards would like to see school funding, which is often tied to local property taxes, changed so that schools in poor neighborhoods are not left with outdated computer labs and inferior libraries. But she acknowledged the challenges in upending how schools are funded. Proponents of such changes, she said, need to point out to people in power, many of them white men, that it is in everyone’s interest to care about the education that black and brown children receive. Children who are well-educated are more likely to be healthy, productive adults. “A well-educated workforce is what we have and if we don't have well-educated people we're going to lose in the global economy,” said Virginia Representative Bobby Scott. Oregon Representative Suzanne Bonamici echoed Scott and Edwards, and said she’d like policymakers to recognize that educating children well means helping parents get involved in the process by raising the minimum wage and expanding family leave so that they have time to invest in their children’s schools. Lily Eskelsen Garcia, the head of the National Education Association, said there is an element of “institutionalized racism” in how schools are funded, and which kids have access to things like advanced placement classes and soccer. But she’s encouraged by the passage of the Every Student Succeeds Act, a federal education law that will return many education decisions to states, and one that she hopes will give more voice to teachers and people working in classrooms. “I think what we’re seeing right now gives me hope,” she said. Andrew McGill July 27, 2016, 2:05 p.m. So far, every convention evening has had its blockbuster moment. Monday saw Michelle Obama lift the crowd to its feet and Bernie Sanders wave his final goodbye; Tuesday night hosted Bill Clinton and a surprise video appearance from Hillary. Tonight, Joe Biden will take the convention stage. He’s introducing Barack Obama, who's introducing vice presidential candidate Tim Kaine. Quite the lineup. Most folks seem pretty sure that President Obama's overwhelming popularity among Democrats, as well as his reputation as an orator, means more viewers will tune in tonight. But I've enjoyed reading some of the bettor's theories on why Wednesday might not win. As one gambler put it, “Tuesday has a shot if Bill busts out the saxophone.” Unfortunately, he didn't. July 27, 2016, 1:33 p.m.
Ron Fournier July 27, 2016, 1:30 p.m.
Trump risks alienating his working-class white Boomer base: Children of the Cold War might be repulsed by his Moscow mewing. Nora Kelly July 27, 2016, 1:09 p.m.
Trump’s comments on Russia are already being walked back and contradicted by his allies. If it is Russia and they are interfering in our elections, I can assure you both parties and the United States government will ensure there are serious consequences. That said, the Democrats singularly focusing on who might be behind it and not addressing the basic fact that they've been exposed as a party who not only rigs the government, but rigs elections while literally accepting cash for federal appointments is outrageous. This has to be the first time that a major presidential candidate has actively encouraged a foreign power to conduct espionage against his political opponent. That’s not hyperbole, those are just the facts. Vann R. Newkirk II July 27, 2016, 12:56 p.m.
Former Attorney General Eric Holder accepted an award from the DNC Black Caucus this morning, and in turn gave them an address that expanded on his speech Tuesday night on the convention floor that discussed criminal justice, gun violence, and voting rights. Holder began with a strong endorsement of gun control. “The problem of guns in this country is something that we have to deal with,” Holder said. He noted that the day of the Sandy Hook shooting was his worst in office, and that he could only in good conscience vote for a candidate that espoused gun-control measures. Notably, one of the candidates that he floated as ideal after a potential Hillary Clinton presidency was Michelle Obama. Ronald Brownstein July 27, 2016, 12:32 p.m. If elected President, Hillary Clinton would abandon President Obama’s Asian trade agreement rather than seek to renegotiate it, one of her top economic advisers told an Atlantic forum Wednesday morning. Clinton’s campaign has been pushing back against the idea that she would accept the TPP agreement since Virginia Governor Terry McAuliffe, a close Clinton ally, told Politico he believed Clinton would eventually support it if she could obtain changes in it. Asked if Clinton would abandon or seek to renegotiate the agreement, which would create a free trade zone between the U.S. and 11 Pacific nations, Sperling sent an unequivocal signal that Clinton intends to shelve it. “I think if she wins presidency her focus is going to be on the things that are clear job creators where you are starting unified,” he said. “And so the idea that she’s going to come in and focus on that as opposed to infrastructure, as opposed to minimum wage, as opposed to higher education, debt-free college” is not plausible. For Clinton, abandoning TPP would amount to a major departure from Obama, not only in economic, but diplomatic, strategy: Obama has touted the agreement as a cornerstone of his effort to “pivot” American foreign policy toward Asia, and supporters see it as central to U.S. efforts to establish a counterweight to growing Chinese influence. Nora Kelly July 27, 2016, 12:17 p.m.
Donald Trump isn't sold on the idea that Russia broke into the Democratic National Committee's email system, or that it did so on his behalf. But he's happy to have Russia target Hillary Clinton now. Asked minutes later if he had “any qualms” asking foreign agents to hack into a U.S. email system, he said “well, they probably have them” already. According to a report Tuesday in The New York Times, U.S. spy agencies have “high confidence” the Russian government hacked into the DNC, though they don’t know if Russia means to influence the election. Trump, for his part, said he wouldn't forbid Russia from interfering in his race against Clinton: “I'm not going to tell Putin what to do. Why should I tell Putin what to do?” In the past, he's praised Putin's leadership and said the two men know each other, but on Wednesday Trump denied they'd ever met. Trump's relationship with Russia dominated much of the press conference. Earlier Wednesday, campaign chairman Paul Manafort denied that Trump was withholding his tax returns because they may show Trump has financial ties to Russia. At the conference, Trump insisted that “I have nothing to do with Russia” when asked repeatedly about any connections he may have. Trump called suggestions that Russia hacked the DNC on his behalf "ridiculous." Still: “Honestly, I wish I had that power. I'd love to have that power.” And further still: If it was Russia, China, or another foreign power, Trump said, it shows that country's lack of respect for the United States. Elaine Godfrey July 27, 2016, 12:04 p.m. In the second part of The Atlantic’s morning briefing in Philadelphia, Ronald Brownstein continued to focus on what Clinton would accomplish in her first 100 days as president, especially with regard to how she plans to engage with Republicans in Congress. Xavier Becerra, the chairman of the House Democratic Caucus, offered a preliminary suggestion: The House should get rid of the Hastert Rule, the informal rule that says a majority of the majority party in the chamber must support a bill before it gets a floor vote. “You should need to get a majority of the House, rather than a majority of your party,” Becerra said, adding that it would ensure the bipartisan passage of things like gun-control measures. Still, Clinton is likely to face other challenges in her first 100 days, if elected. Among them, a complex foreign policy agenda, said Nicholas Burns, Roy and Barbara Goodman Family professor of the practice of diplomacy and international relations. Her priorities should include containing Russian President Vladimir Putin in Eastern Europe, “making sense” of the Middle East, specifically with regard to Israel and Turkey, and maintaining a strong relationship with China, he said. Vann R. Newkirk II July 27, 2016, 11:43 a.m.
One of the undercurrents of the convention here in Philadelphia is the omnipresence of Baltimore Mayor and DNC Secretary Stephanie Rawlings-Blake. From the moment of her emergency call-up to gavel in the proceedings—itself a more interesting gaveling than any gaveling has the right to be—Rawlings-Blake has headlined and addressed several audiences at the convention's constellation of events. As president of the U.S. Conference of Mayors, she helped kick off their strong rebuke of Donald Trump on Tuesday. On Wednesday morning, she opened a meeting of the Congressional Black Caucus, just an hour after it was announced back in her home city that all charges would be dropped in the remaining trials for the police officers involved in Freddie Gray's death. Her schedule has been busy—to say the least. Although she did not seek re-election for the Baltimore mayorship, it looks like her profile is rising in the party. Elaine Godfrey July 27, 2016, 11:16 a.m.
On Tuesday night, Hillary Clinton made history as the first woman to secure a major-party nomination for the U.S. presidency. And in less than four months, she could win the White House. But how would she govern? Ronald Brownstein posed this question to Clinton’s campaign chair John Podesta during The Atlantic’s morning briefing in Philadelphia, asking him what might be expected in the first 100 days of a Hillary Clinton White House. Also on Clinton’s agenda is the economy and getting wages up: “That means a focus on jobs, on infrastructure, on making the right investments,” Podesta said, adding that she will continue to work in conjunction with Bernie Sanders. With regard to criminal-justice reform and Black Lives Matter, Clinton will focus on acknowledging the vestiges of racism in America. She’ll “say it out loud that racism still overhangs the structure of our society and our economy,” Podesta said. What will her approach look like? Podesta pointed to an address she gave earlier this month at the 200th anniversary of the AME church in Philadelphia in the wake of the killings of police officers in Dallas. All said, what would a Clinton administration look like? Let’s just say there won’t be a lot of returning faces from the ‘90s: “She wants a diverse group of people, committed to progressive change,” Podesta said, people who won’t get caught up in the bureaucracy of the White House. Clare Foran July 27, 2016, 10:39 a.m.
Well, this is certainly an anti-climatic way to end a presidential run: Bernie Sanders told a group of delegates Wednesday morning “as of yesterday, I guess, officially our campaign ended,” according to the Associated Press. Sanders’ remarks to delegates from Vermont, New Hampshire, Maine, and Rhode Island comes after he helped Hillary Clinton formally secure the nomination in a dramatic gesture of goodwill Tuesday. It was probably inevitable that Sanders would stick it out until the bitter end given his promises to continue the fight as long as possible. Effectively, though, his campaign for president ended earlier this month when he endorsed Clinton for president, even if technically he remained a candidate until the convention. Priscilla Alvarez July 27, 2016, 10:10 a.m.
On Monday, Donna Brazile apologized for the extensive leak of DNC emails that showed staffers favoring Hillary Clinton. “Those words to not reflect the spirit of this party,” she said. As the incoming interim chairman of the Democratic National Committee, she intends to make it up. 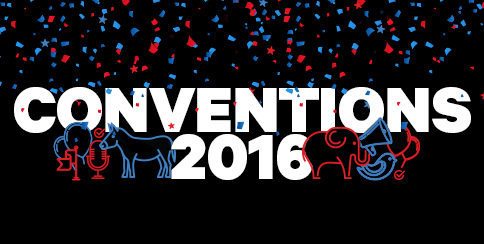 Until then, however, the historic nature of the convention will not be lost. “I have requested that every member of the staff, every member of the DNC—I am basically requesting that they close the office down on Thursday. Maybe one or two people can stay to keep the lights on, or turn them off and make sure nothing else is, you know [happening]. I have requested they come up to Philadelphia to celebrate this historic occasion. I want them part of this. I don't want them [to be left] behind. I'm not leaving anybody behind,” Brazile said.